Temple Grandin is essentially the "mother" of modern autism. She's arguably the person most responsible for the recognition of autism as a condition which can not only be "lived with" but which provides benefits not otherwise found in society. If you're wondering who Temple Grandin is, I'd like to direct your attention to the excellent 2010 HBO film starring Claire Danes. It's well worth a watch and will give you a great understanding and appreciation of Temple's place in the world of autism. You can watch the Trailer for the film here. You can't get very far in autism research without discovering Temple Grandin and I think it's only fair to say that everyone connected to autism, to Asperger's syndrome or to Sensory processing difficulty should read at least one Temple Grandin book. Of course, not everyone is a reader and even among avid readers, it's not always easy to find the time to sit down and read, particularly if you're also a carer for a child on the autism spectrum. That's where this book comes in handy. At 45 pages of text followed by 75 pages of short questions and answers, this book is a breeze to read and very easy to pick up and put down at a moments notice. If you have already read one of Temple's other books, such as the excellent "Temple Grandin: The Way I See it" then you probably won't learn anything new here (although this is a handy reference and much easier to carry). If you haven't read one of Temple's books before then this one is a great place to start. It's packed with information and tips all geared towards helping your child to make the most of the opportunities that life presents. It's mainly aimed at children between the ages of five and about sixteen but there is still information which is relevant to younger children and some discussions, such as driving and working are relevant to adults. The only quibbles I have are that Temple is very much a product of her time and sometimes her age seems to show with an aversion to technology, and possibly too much focus on "manners" for the modern world. These more dated tips are admittedly, given for the right reasons but as Temple hasn't raised kids herself she doesn't anticipate the "backlash" that kids of today have or the lack of modern options for dealing with it. Quibbles aside, this is an excellent book, which is particularly well suited to busy parents and those less enthusiastic about reading. It's also one of those books that belongs in the waiting rooms of developmental paediatricians everywhere because the layout and wonderfully indexed front pages mean that it can be read so quickly or used to randomly jump from one topic to another. It will also answer so many of the most common questions that parent have about raising a child with autism. 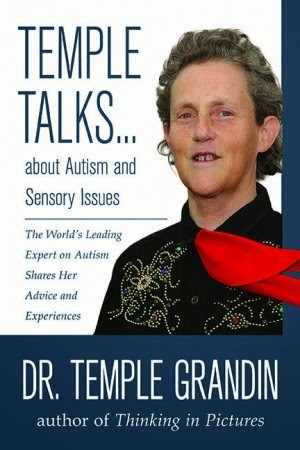 Temple Talks... about Autism and Sensory Issues: The World's Leading Expert on Autism Shares Her Advice and Experiences by Dr. Temple Grandin is available from Sensory World and Amazon.as either a paperback or an eBook. It's a great "first" Temple book. Thank you for the fine review of Temple's book. I have not read it so I don't know how much of it is focusing on manners. As a Asperger who is a gramma I sure would like to see manners addressed in this world of "it's all about me". Manners and character seem to be a thing of the past. Manners whether one has asperger's or not should be reintroduced into society. I also think her attitudes towards manners is more than a quibble. It is evidence she doesn't 'get it'. All human beings, not just those on the spectrum, should not be interfered with when their behavior does not objectively cause harm. Many social conventions that fall under the umbrella of manners derive from religious traditions, and so forcing those conventions on people also infringes their religious freedom rights.